How do I automatically create a case on inbound email? I feel like this is an incredibly basic question, but I have read through the user guide, the admin guide, and searched stackexchange and google, and I have not found the answer. I have set up an e-mail account to receive inbound emails, and I have successfully configured CiviCRM to check that account, pull in email, and turn those emails into Activities on the contact record. So far, so good. But what I want is for any inbound e-mail to become a case in CiviCase. In the CiviMail chapter the Email Processor was described as a way to get inbound and outbound emails into CiviCRM as non-case activities. 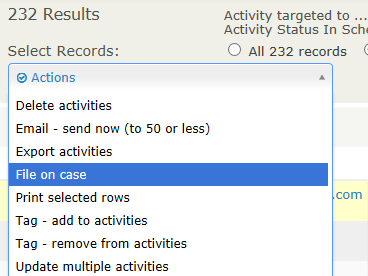 When you enable CiviCase, a new action will be available that allows you to file any non-case activity onto a case. Where is that new action? I edited the Scheduled Job for Process Inbound Email, and it doesn't have an option to put new emails into a case. It can't do that out of the box but you could theoretically write an extension to use hook_civicrm_emailProcessor to create the case when an email comes in. But unless you always want the client to be the From address, you'd have to figure out how to decide who is the client if there's multiple To/Cc's. You'd also have to decide what to do when the client/case already exists for an incoming email or you might get duplicate cases. For the second part of your question, there used to be a link that appears on the far right-hand side of activity search listings, and a button at the bottom of the page when you view activities, but it looks like maybe this has changed in the latest version. But I can see it under search results in the dropdown under Actions (e.g. after doing Search - Find Activities). You could achieve this with the CiviRules extension, although I am not sure if all the conditions and actions you would require are in the box yet. It would be fairly straightforward to develop them. Not the answer you're looking for? Browse other questions tagged email civicase or ask your own question. How do I email to two addresses on an individual without Civi creating a new record for the second email address? How are CiviCase Case ID numbers generated?